Canada Reads… Where to start? I’m still recovering from the Canada Reads 2011 finale on Wednesday. I stayed at home that morning, sequestered alone in our third floor library. It was very peaceful and quiet as the clock wound down to the start of the final debates. 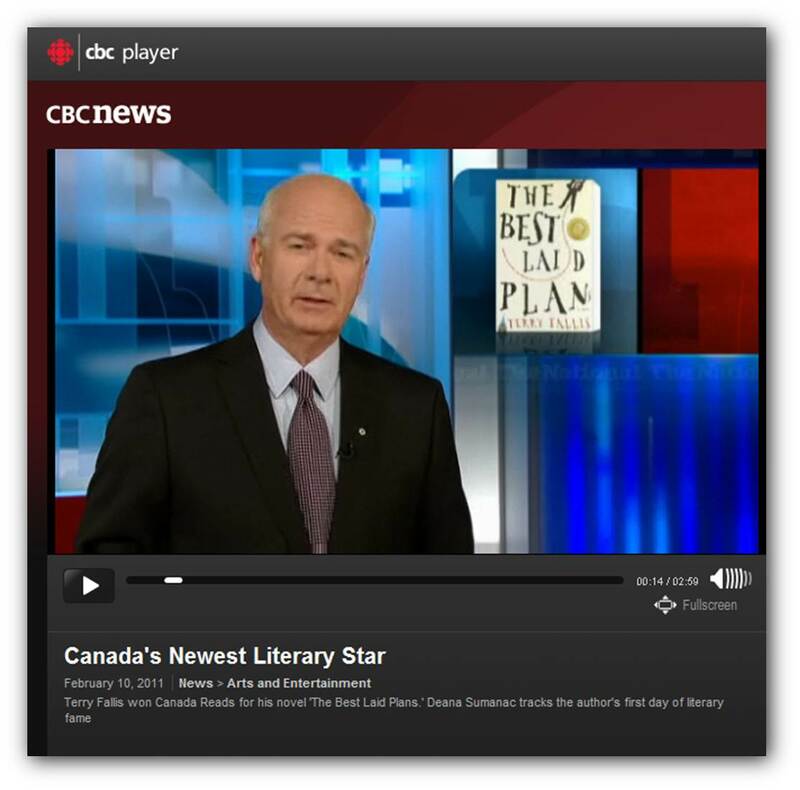 At about 10:00 a.m., I logged in to the Canada Reads site and started watching the live video streaming. It is not a word of a lie to say that I fully expected The Best Laid Plans to be bounced on the first vote of the finale. As I considered the five defenders, I simply couldn’t figure out how we were going to avoid three strikes against us in that first vote. Clearly my political analysis needs some work. I never dreamed that Carol Shields’s novel, Unless, would get its walking papers instead. When Sara Quin voted to oust The Birth House in the second vote of the day, it was all over. 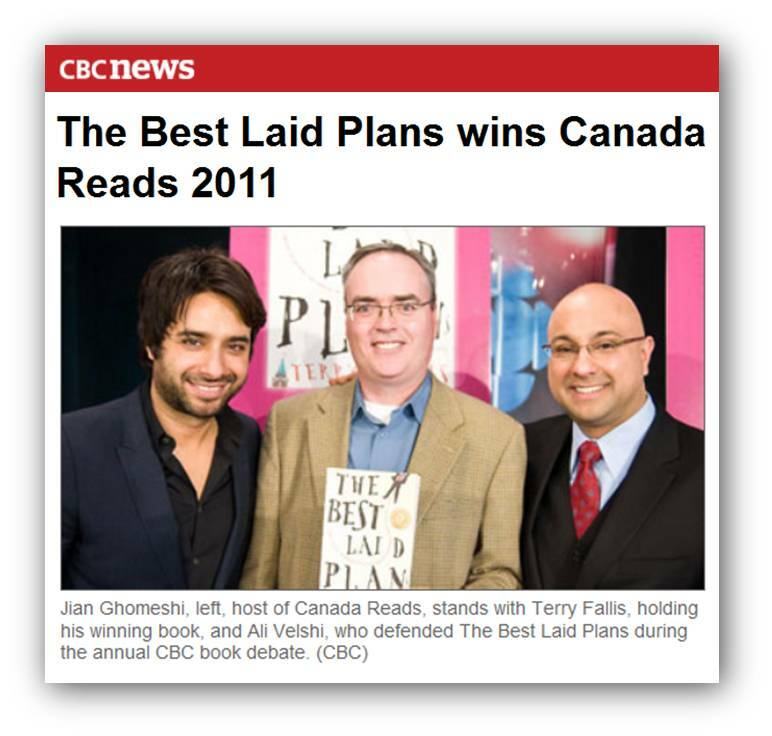 Somehow, The Best Laid Plans was crowned the Canada Reads 2011 winner. Unbelievable and wonderful. I can’t put it all into perspective yet. I’m still floating a few feet above the ground and don’t expect to touch down anytime soon. To me, it was a miracle. CBC really kicked Canada Reads onto a higher plane this year with the live video streaming, the public participation in the selection process, the use of social media, the recruitment of amazing panelists, the three hour-long shows, and of course, the dramatic music. It made for a great show. And Jian Ghomeshi did an amazing job as our fearless leader. I was speaking to Ali Velshi before we went into the Q studio for our Thursday morning interview, and we agreed that we’d never really seen someone strike the perfect tone and mood the way Jian does. And that’s high praise from 10 year broadcasting veteran and CNN’s Chief Business Correspondent Ali Velshi. Jian was fantastic managing the debates and the tensions they often triggered. It’s not easy, despite how effortless and natural he made it look. Behind Jian, there is a dedicated Canada Reads team who worked tirelessly to pull this off. I got to know Erin and Debbie, but there were others to. I’m grateful for all their efforts. What can I say about Ali Velshi? I was impressed with him when he was a teenager working on the 1984 Jean Chretien Leadership Campaign with me, and I was blown away by him during the Canada Reads debates. He was passionate, eloquent, compelling, yet respectful throughout (as were the other defenders). Ali really understood The Best Laid Plans and how to position it persuasively. You could see the other panelists nodding in agreement when he spoke. I truly believed The Best Laid Plans was a longshot to win Canada Reads. For all I know, Ali felt the same way, but he never wavered from his opening position that he was going the distance with TBLP. And he was right. I cannot think of anyone who would have, or could have, defended the book any more passionately or effectively as did Ali. I am in his debt. A word about the other authors and panelists. While the defenders got their elbows up in the debates, there was never even the slightest trace of competition among the authors themselves. We seemed to bond instantly and I very much enjoyed my time with them in person, and online. They are not just wonderful writers, but great people too. I also really enjoyed meeting the other defenders. They were serious about their responsibilities and served their authors well. I liked them all. Finally, I really want to thank the CBC for undertaking this important program. The CBC deserves our admiration for creating Canada Reads and for making it such a significant part of our cultural landscape over the last ten years. You can’t argue with the results. Canada Reads puts books into Canadians’ hands. I know. The Best Laid Plans shot to the top of the heap on Amazon, Chapters-Indigo, and Kobo. That’s the Canada Reads effect. The surreal circus has truly come to town. The day after the Canada Reads finale, a lovely reporter and camera crew from CBC’s The National trailed me around to record “the day after.” Click here, or on the graphic below to watch the resulting story. What an amazing ride it has been. Saying “thanks” seems utterly inadequate, but until we develop a new and more powerful expression of gratitude, my unreserved thanks to everyone who helped make this miracle. It took a little longer than with the Kindle store and the Sony Reader bookstore, but TBLP has just landed on KOBO, the Canadian ebook retailer. 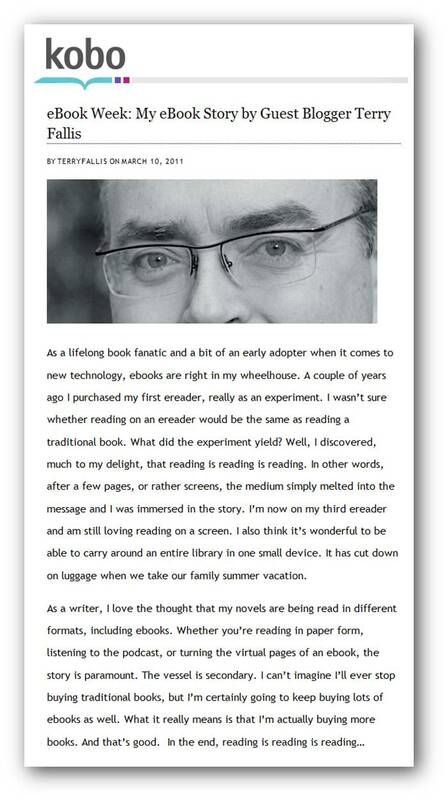 I’ve really enjoyed reading novels on my Sony Pocket Reader and I think many others do too. I’m glad that readers can get TBLP, and soon, The High Road too, as ebooks. Reading is reading, paper or screen.